Many people are not aware of the vast quantity of public space around them. For most communities, the largest areas of public space are streets. Is this public space used to its full potential? Alongside the well-understood needs of mobility and commerce, with thoughtful design and input from communities, streets can have a much deeper value to everyone who shares them. Done well, streets can express the culture and history of their communities, and be places which afford protection and comfort — which invite people to stay, play and enjoy. Despite the fact that streets are public spaces, few people think of this space as ‘theirs’. The National Street Service exists to spread the notion that the street is yours — yours to use in ways that are meaningful to you, and yours to change to better reflect the values of your community. Elevating a simple thoroughfare to space we all treasure is the opportunity before us. 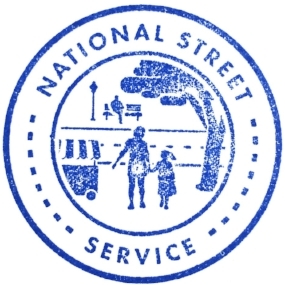 Since our inception in 2017, the National Street Service has been building a participatory social movement to transform America’s streets into enjoyable and fulfilling places for all people. In our first phase, we piloted a volunteer organization from the ground up in San Francisco, CA — recruiting volunteers, building a curriculum, running a training program and hosting community meetings with a team of 20 volunteers. For our second pilot, now in progress, we are improving on and expanding our programs based on what we learned, across four new cities and 100 incredible volunteers in Boise, ID, Philadelphia, PA, San Antonio, TX and Pontiac, MI. The pace is frenetic and the challenges numerous — we are responding to volunteer feedback in real time and rapidly prototyping, testing, and refining our ideas. Volunteer training activities — centered on observation, reflection, and conversation in the street. Through a comprehensive training program, we aim to create champions for our nation’s streets who are equipped with the knowledge to act individually and collectively to make meaningful change on the streets that matter to them. Volunteers complete a program of activities centered on observation, reflection, and conversation in the street. Through this process, the volunteer sees their streets with fresh eyes — taking time to celebrate what they value, and identify opportunities to better meet the needs of those who share the streets. In the next stage of training, volunteers are guided to take the ideas and questions they gather, and transform them into low-budget ‘experiments’ which are conducted on the street. The experiments prompt volunteers to use techniques borrowed from Tactical Urbanism, creating temporary changes to public space. Experiments are drawn from the volunteer’s own experiences and ideas, and the result is hyper-local and individualized — avoiding the pitfalls of design by committee and lengthy, arduous planning hurdles. The result is simple — a quick pulse check on the effectiveness of basic street improvements, and evidence to bring forth to local planning authorities in support of larger projects. And the impact on volunteers can be transformative — through the training, volunteers’ own understanding of the street and what it can be is expanded. Every volunteer action in the street is an opportunity to offer alternative visions for the streets in a way that provokes reactions, opening the door for meaningful conversations. We hope that everyone who interacts with National Street Service projects feels heard, welcomed and understood, because if we want the streets of the future to better need the needs of all who use them, we need to capture the diversity of needs expressed within each community. Self-directed volunteer actions designed to invite meaningful dialogue about the needs of local streets. Behind the scenes the work of National Street Service is powered by the team at ‘Headquarters’. It is staffed by specialists from the founding partners Greenfield Labs and Gehl Studio, plus members of urban communities around the country. We are urbanists, mobilizers, designers and mobility experts, working towards realizing the vision of a human-centered street. The contribution of both parties is clear in the driving philosophies of the National Street Service. Greenfield Labs offers strength in human-centered design, design research and mobility. Gehl brings strength in the field of making cities for people, with expertise in ethnographic observation, urban design, and iterative placemaking. Greenfield Labs’ human-centered approach contributes to the participatory nature of the work; putting the tools of design research in the hands of everyday people. After all, who better to ask about how streets can be improved than the people who see, experience and feel their local streets every day? If you were the boss of the National Street Service, what would be your ultimate goal? If your passion is stirred, your time has come. Join us. Help us build a movement to realize human-centered streets in every community and for all people, by transforming the rules, norms and physical design of this precious resource. For a taste of the volunteer experience, try the first exercise in our volunteer training — a guided reflection podcast. If you like what you hear, our entire volunteer training kit is available to download and print on our website. For training on the go, the Streets! app offers our entire curriculum in a digital format. And if you’re curious to follow along, follow us on Twitter, Instagram, or join our mailing list. What are you waiting for? The street is yours. Newer PostSummer Grants, Shareback updates, announcing our app!